Asia’s leading non-life insurer celebrates 50th anniversary of its presence in Thailand by contributing to create a safer society. Bangkok, 24 November 2014 – About 800 guests, including His Excellency Shigekazu Sato, Japanese Ambassador Extraordinary and Plenipotentiary to the Kingdom of Thailand; and Her Excellency Kobkarn Wattanavrangkul, Minister of Tourism and Sports of Thailand, attended a ceremony in Plaza Athenee Bangkok marking the 50th anniversary of Mitsui Sumitomo Insurance Company Limited Thailand Branch (“Thailand Branch”). At the event guests were treated to an exhibition showcase of Thailand Branch’s annual strategic Corporate Social Responsibility (“CSR”) projects to promote road safety. Recognising that traffic accidents have been a major public health and socio-economic issue in Thailand, Thailand Branch has been committing to 3 key annual projects since 2008 that aim to raise awareness about drunk driving, promote the wearing of helmets in children, and fund research to reduce traffic accidents. In support of the Don’t Drive Drunk Foundation, Thailand Branch organises a yearly contest for Thai university students to create innovative communication tools such as posters and video clips. The video clips and posters are then provided to the Foundation to be used in their awareness campaign. Thailand Branch actively engages with the Department of Disaster Prevention and Mitigation (DPM) to distribute children’s helmets in the Samutprakan province, as well as partnering with AP Honda to conduct safety riding lessons. Every year 4 research grants of up to THB150,000 each were awarded to fund researches that identify the causes of road accidents and to find solutions to help to reduce the number of accidents. After some consecutive years of carrying out these initiatives, Thailand Branch was awarded the Prime Minister’s Road Safety Award for 2011. This year, the number of CSR projects organised were more than double over last year with a wider coverage including environmental sustainability, road safety awareness, renovation of school buildings and donations to those in need and victims of natural catastrophe. These projects, the brainchild of Thailand Branch employees themselves, aimed to strengthen long term relationships with the community and boost unity amongst employees. Over 300 employees volunteered their time and energy over the span of 8 months in these projects. Mitsui Sumitomo Insurance (“MSI”) first started expanding overseas in 1934 and Thailand was the first to have a fully fledged Branch outside of Japan back in 1964 with the main purpose to support the increasing trading and investments of Japanese companies in Thailand. Today, the MS&AD Insurance Group, of which Thailand Branch is a key part, aims to be the no.1 general insurer in terms of direct premiums, profits and service quality in Asia. Mitsui Sumitomo Insurance Thailand Branch, aligned to the ambitions of the Group, plans to acquire new business by insuring mega projects through leveraging on its strong international service network, financial strength and professionalism in providing value added services to its clients. Beyond achieving business targets, Thailand Branch strives to enhance its corporate strength by adopting best international practices in conducting business and actively contributing to the development of Thai society. Established in 1964, Thailand Branch, based in Bangkok serves to provide all classes of general insurance for manufacturers and their affiliates. In the past 50 years, its business has grown in line with local social and economic development and has shared common challenges. Amongst more than 60 non-life insurance companies in Thailand, Mitsui Sumitomo Insurance Thailand Branch is consistently ranked in the top ten non-life insurers by direct premiums based on the Office of Insurance Commission 2011-2013. Thailand Branch is proud of its extensive experience and professionalism in marine insurance and the ability to underwrite large risks such as multi-billion infrastructure projects and factories. Backed by the solid foundation and rich heritage of the MSI group which has strong financial ratings from leading rating agencies, Thailand Branch has over the years provided bespoke insurance solutions for large-scale Japanese manufacturers and their affiliates, and motor insurance via car dealers. Thailand Branch offers insurance solutions for all lines of business that are effective, efficient and simple to understand, delivered with active and sincere service to corporate clients of any nationality. In 2012, Thailand Branch was awarded the 1st Prize Prime Minister’s Insurance Award 2011 for Non-Life Insurance Company with Outstanding Management, the first for a foreign non-life incorporated insurer in Thailand. The sound performance of Thailand Branch during the period 2003 to 2013 has resulted in it being awarded the Prime Minister’s Insurance Award 9 times by the Office of Insurance Commission, Thailand. MSI was formed in October 2001 through a merger between the former Mitsui Marine & Fire Insurance Co., Ltd. ("Mitsui Marine") and the former The Sumitomo Marine & Fire Insurance Co., Ltd. ("Sumitomo Marine"). Mitsui Marine and Sumitomo Marine were leading Japanese non-life insurance companies with proud and long histories, having been established in 1918 and 1893, respectively. 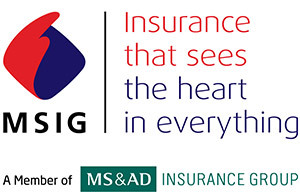 MSI also benefits from being a member of MS&AD Insurance Group – one of the largest general insurance groups in the world.